Ander Herrera looks set to leave Manchester United this summer for PSG when his Old Trafford contract expires. 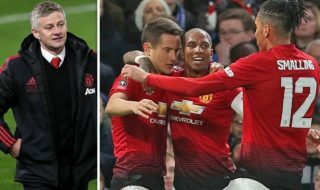 His current manager, Ole Gunnar Solskjaer, believes uncertainty surrounding Herrera might have ‘worried’ the midfielder as he faces another lay-off. The Spain international has been performing well since Solskjaer arrived, but it now looks like he will be playing his football in Ligue 1 next season, earning a much bigger deal reportedly worth £200,000-a-week. The Times ran a report claiming he has agreed on a pre-contract agreement with PSG amid a lack of communication from United in recent months. He has missed United last two defeats to Wolves and Barcelona with a thigh muscle injury and could have to face a longer spell in the treatment room. Solskjaer has already seen one midfielder leave with Marounae Fellaini joining the Chinese Super League in January. He emphasised that he wants to keep Herrera. “He’s been working really hard to get fit from his injury that he sustained against Liverpool in February,” Solskjaer said, as quoted by the Manchester Evening News. “Then he came back and got a different one here in training. “He’s been really putting a lot of work in and unfortunately that’s come at a time of, as you say, there are contract talks but that’s ongoing. I can’t really comment too much on how far they have come down the line and what he’s deciding. You have to ask him. I don’t know how they’ve been the last few talks. Solskjaer clearly likes Herrera, but what does he mean by ‘maybe the future might have been worrying him and maybe that’s part of the reason that he’s injured’? How can concern or worry contribute to a muscle injury? Anyhow, we have some big games coming up and need Herrera back fit as soon as possible. He’s replaceable but at this moment in time, United’s options are limited.